The High School for Recording Arts provides young people a chance to realize their potential, despite any previous setbacks. The students exhibited impressive qualifications based on academic and extracurricular activities in their communities and will become outstanding, future leaders. Lewis' perseverance and hard work paid off with improvement and success academically and in the High School for Recording Arts program. She is a worthy recipient of the Drake Scholarship. 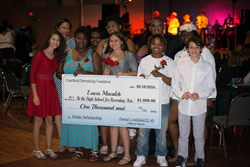 Crutchfield Dermatology is pleased to award three students with scholarships for the 2016-2017 academic year: Carlisha Willis; Adri Cerrato; and Lewis Macaleb. “Carlisha, Adri, and Lewis are receiving these awards for their overall commitment to, recovery and improvement in the High School for Recording Arts program. They are role models for their service to the community, participating in events on a regular basis. Their perseverance and hard work have paid off with improvement and success academically and in the High School for Recording Arts program.” said David TC Ellis, Executive Director of HSRA. Over 200 community members, civic leaders, community members, sponsors, and supporters gathered for the Second Annual Gala, held Saturday, June 18. Guests enjoyed a buffet-style sit-down dinner, live musical performances by HSRA students and the Not Guilty Band, and a live auction. David "T.C." Ellis, the HSRA founder, explained, "We are particularly grateful to our sponsor, Crutchfield Dermatology." Crutchfield Dermatology scholarships go to qualified students to lessen the burden of higher education. The scholarships can be used for supplies, books or tuition at licensed, accredited institutions of higher education (including trade schools) and are paid directly to the educational institution. For more information about the Crutchfield Dermatology scholarship program, please visit http://www.crutchfielddermatology.com/. Crutchfield Dermatology''s involvement in the community stems from Charles E. Crutchfield III MD and his passion as a mentor, teacher, and leader. The charitable branch of Crutchfield Dermatology was set up to encourage volunteer work and community enrichment, and the teaching and mentorship of physicians at all levels of training. The charitable branch provides scholarships and creates articles, educational presentations, online materials, and books. Major successes include support of a one-of-a-kind lectureship on ethnic skin at the University of Minnesota, and publishing and distributing a children’s book protecting skin from solar damage. Crutchfield Dermatology is a key supporter of Camp Discovery, a summer camp for children with severe skin diseases. Dr. Crutchfield also has created and sustained a named lectureship at the University of Minnesota dedicated to ethnic skin. Through the foundations combined works he has been at the forefront of improving the health of Minnesotans, and particularly Minnesotans of color. One of their premier events is its annual 5K in Eagan. Going into its fifth year, the Crutchfield Dermatology 5K has been very successful, raising funds to benefit the American Academy of Dermatology’s Camp Discovery program. The date for this year’s event will be Saturday, September 17th.